Why Is It Important To Improve Yourself? More often than not, we think and believe that someone or rather, most people are better than us.- when in reality, the fact is, most people are more scared than us. You spot a totally eye-catching girl sitting by herself at a party, casually sipping on a glass of Asti Spumanti. You think to yourself, “she looks so perfectly calm and confident.” But if you could read thru her transparent mind, you would see a bunch of clouds of thoughts and you might just be amazed that she’s thinking “are people talking about why I am seated here alone? … Why don’t guys find me attractive? We look at other people, envy them for looking so outrageously perfect and wish we could trade places with them, while they look at us and thinks of the same thing. We are insecure of other people who themselves are insecure of us. We suffer from low self-esteem, lack of self-confidence and lose hope in self improvement because we are enveloped in quiet desperation. Sometimes, you notice that you have an irritating habit like biting off your finger nails, having a foul mouth, and you – of all people, is the last to know. I have a friend who never gets tired of talking. And in most conversations, she is the only one who seems to be interested in the things she has to say. So all of our other friends tend to avoid the circles whenever she’s around, and she doesn’t notice how badly she became socially handicapped – gradually affecting the people in her environment. One key to self improvement is to LISTEN and TALK to a trusted friend. Find someone who you find comfort in opening up with even the most gentle topics you want to discuss. Ask questions like “do you think I am ill-mannered?”, “Do I always sound so argumentative?”, “Do I talk too loud?”, “Does my breath smell?”, “Do I ever bore you when were together?”. In this way, the other person will obviously know that you are interested in the process of self improvement. Lend her your ears for comments and criticisms and don’t give her answers like “Don’t exaggerate! That’s just the way I am!” pen up your mind and heart as well. And in return, you may want to help your friend with constructive criticism that will also help her improve her self. One of Whitney Houston’s songs says “Learning to love yourself is the greatest love of all.” True enough. In order to love others, you must love yourself too. Remember, you cannot give what you do not have. Before telling other people some ways on how to improve themselves, let them see that you yourself is a representation and a product of self improvement. Self improvement makes us better people, we then inspire other people, and then the rest of the world will follow. Stop thinking of yourselves as second-rate beings. Forget the repetitive thought of “If only I was richer… if only I was thinner” and so on. Accepting your true self is the first step to self improvement. We need to stop comparing ourselves to others only to find out at the end that we’ve got 10 more reasons to envy them. We all have our insecurities. Nobody is perfect. We always wish we had better things, better features, better body parts, etc. But life need not to be perfect for people to be happy about themselves. Self improvement and loving yourself is not a matter of shouting to the whole world that you are perfect and you are the best. It’s the virtue of acceptance and contentment. When we begin to improve ourselves, we then begin to feel contented and happy. 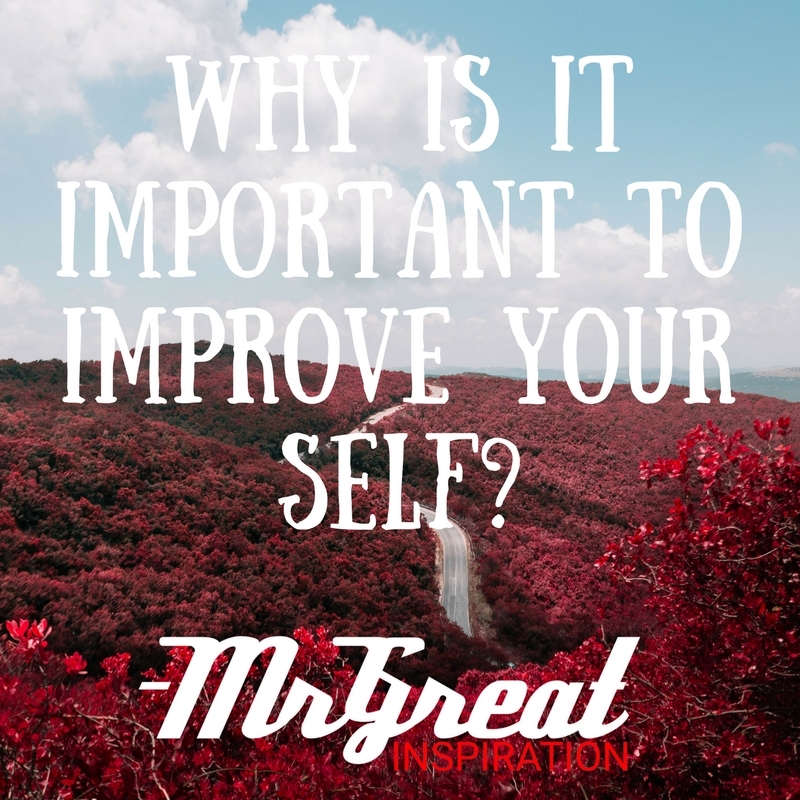 We hope guys you find our article "Why Is It Important To Improve Yourself?" by Mr Great Inspiration useful. If you think we have made some efforts, then don't forgot to appreciate us by sharing this inspirational article with your friends and family, And thanks for visiting.